It’s time to get the best deal that BusOnlineTicket.com and GJG Express have to offer to our most supportive customers. BusOnlineTicket.com is very excited to announce that GJG Express has launched their special promotion for 2-way ticket for bus between Penang and Genting Highlands. GJG Express’s ticket price for bus from Penang to Genting Highlands and bus from Genting Highlands to Penang is from RM 42.00 per way. However during this promotion period, whoever book the Return bus ticket (2-way) with GJG Express are entitled to enjoy RM9 OFF for the return trip. Hence, the total cost for 2-way bus ticket between Penang and Genting Highlands is only RM 75.00 (Normal Price: RM 84.00). The discounted price will be displayed in the payment page inside the “Payment Summary” column. GJG Express is one of the popular bus operators headquartered in Penang, Malaysia. GJG Express always provide well-maintained bus and excellent quality of service to ensure passengers can have a comfortable and secure bus journey. For bus service between Penang and Genting Highlands, the boarding and arrival point in Penang is located at Sungai Nibong Bus Terminal, Komtar Penang and many more. Meanwhile, the boarding and arrival point in Genting Highlands is located at Genting Awana Bus Terminal and First World Hotel. So, what are you waiting for? Book your 2-way bus ticket between Penang and Genting Highlands via BusOnlineTicket.com and travel with GJG Express now. Follow us on Facebook and Instagram to keep up to date with all our latest promotions. Terms and conditions apply. 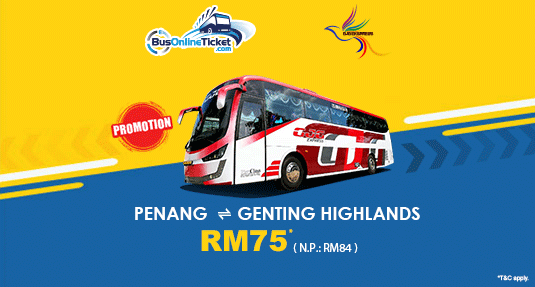 The promotion is valid for 2-way GJG Express bus ticket bookings between Penang and Genting Highlands at BusOnlineTicket.com only, subject to the availability. The promotion is valid for the first 500 redemption on BusOnlineTicket.com only. The promotion is not exchangeable for cash and any unutilized amount is strictly non-refundable. The promotion cannot be used in conjunction with any other discount or e-voucher. Any other charges, including (but not limited to) processing fee, travel insurance or personal expenses orequest, shall be borne entirely by the customers.